Regular visitors to these pages will by now be familiar with the Ceremony of the Quit Rents and some of the rituals and artefacts associated with the ceremony, in particular the six horse shoes and sixty-one nails referred to in the newly released novel, which is for a forge in Tweezers Alley, just south of St Clement’s Dane, which stands in the centre of the Strand, close by the the Royal Courts of Justice. The rights to the forge were granted in 1211 to Walter-le-Brun who was a former Sheriff of the City of London. The forge was to be sited at the corner of a field on land belonging to the Knight Templar, which may have been their tournament or practice field or may simply have been next to where their horses were exercised. But what were Knights Templar doing on the banks of the Thames, far from the Holy Land and the conflict there? The Templars were originally nine knights, together with their followers and servants, who took monastic vows on Christmas day in 1119 and styled themselves as poor soldier-followers of Jesus Christ. 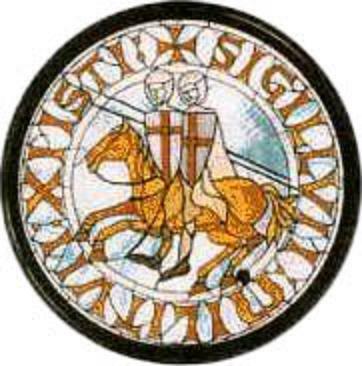 Their symbol, two knights riding a single horse, was supposed to reflect this poverty and to remind the knights of their vows and their reliance on each other. They were housed in the ruins of the Temple of Solomon in Jerusalem, of which only the Wailing Wall now survives, and they dedicated themselves to protecting the routes used by pilgrims through Europe and down through the Levant to the Holy Land. Clearly nine knights were not sufficient to protect a pilgrimage through the whole of medieval Europe to the Middle East, but these were not just any nine knights. These were men of power and influence who had dedicated themselves to a spiritual quest. They believed they were saving the souls of the many pilgrims who made their way via Malta, Rhodes and Cyprus to Tripoli and down through Syria to Jerusalem. With a modern perspective we see the crusades rather differently, but for these men there was no nobler cause. In order to protect the pilgrim roads, they needed men, supplies, horses, arms, and castles from which to deploy them, and for that they needed money. They organised themselves and began building a network of recruits. In cities across Europe they built small round churches after the model of the Church of the Holy Sepulchre in Jerusalem, calling them New Temples, and around those churches they formed a military, administrative, political and diplomatic machine. They provided a secure way to transfer wealth across Europe and became one of the pillars of European commerce, a prototype for international finance. They bank-rolled expeditions and formed links with every major house in Europe. A hundred years later and the original nine have spawned an organisation of huge wealth and power, forming the rear echelons of crusader armies with a network of fortresses from one end of Christendom to the other. One of the New Temples was to be found on the banks of the Thames, consecrated in 1185, and because of the financial and diplomatic connections, a key relationship was formed with the newly formed Exchequer, which needed secure accommodation near to Westminster and the links into international trade, banking and diplomacy that the Templars could provide. Such power brought suspicion, though, and the secrecy surrounding the Templars only served to deepen this. The attempts to seize the Holy Land for Christianity had failed and there were allegations that the Templars were turning away from their original purpose of protecting pilgrims to the pursuit of power. The end came in 1307 when King Philip IV of France ordered the current Grand Master of the Order of the Knights Templar, the Frenchman Jaques de Molay, to attend him in Paris and to bring the treasure of the Order with him. The Grand Master should have been more circumspect, for Philip IV of France was a religious zealot who had been fiercely critical of the Templars, describing their practices as blasphemous and accusing them of sexual immorality. More importantly, he was broke. The Templars were arrested and a papal investigation instigated. When little evidence of any wrongdoing emerged, the members of the order were tortured to provide the necessary confessions. The Grand Master and sixty of his men were burned at the stake and the wealth of the Order was seized. The Pope, Clement V, who was in thrall to the King of France, suppressed the Order and they were disbanded. Over a third of their members tortured or killed. However, England disputed the seizure of the spoils by France and the land south of Fleet Street was claimed by the throne. Members of the Templars were allowed to enter other Orders and to remain. The land became administered under the Knights Hospitaller of the Order of St John and tenant societies were formed, taking on the education and tutelage of the lawyers and advocates of the land. The links with the Exchequer remained strong and the societies flourished in their new role. The Honourable Societies of the Inns of Court became the successors of the Knights Templar who vanished as an Order, but the symbols of their origins are still evident. Wandering around Middle Temple today, you will see in the stonework and in the emblems on doors, and above gateways, the symbol of the Lamb and Flag as it was carried back from the crusades by the Templars. It stands over the doorway to the main hall where the barristers gather their pupils to eat and hear lectures on law and advocacy, and of course it is within the name of the Inns of Court and the Temple tube station that serves them. The Templars may have gone, but their successors still bear their mark. This entry was posted on November 21, 2009, 4:25 pm and is filed under History. You can follow any responses to this entry through RSS 2.0. Both comments and pings are currently closed.